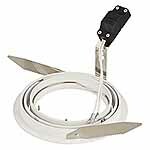 This fully adjustable AR111 round downlight is available in white, black, or brushed aluminium. It is designed for the AR111 12volt max 75watt or 12v AR111 LED lamp. 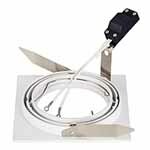 This fully adjustable AR111 square downlight is available in white, black, or brushed aluminium. This fully adjustable AR111 2 x square downlight is available in white, black, or brushed aluminium. This multidirectional single head recessed flush mount AR111 fitting is available in white or silver. It is designed for the AR111 12volt max 50watt lamp. This multidirectional double head recessed flush mount AR111 fitting is available in white or silver. 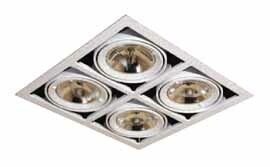 This multidirectional triple head recessed flush mount AR111 fitting is available in white or silver. This square multidirectional quad head recessed flush mount AR111 fitting is available in white or silver.